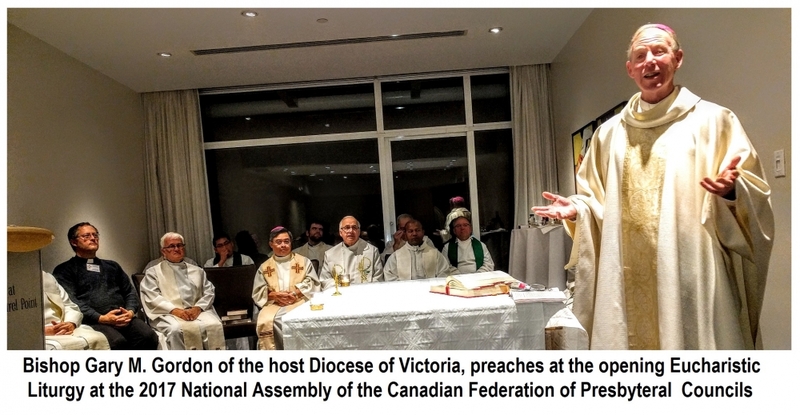 On Canada’s easternmost coast, the CFPC representatives from the Maritime Dioceses were waking up to their alarms as early as 3:00 AM to get their rides to the airport to catch their flights to travel right across the country to Victoria, BC. Delegates from as far as Corner Brook and St. Johns in Newfoundland joined brother priests from all across Canada - including Ontario and the western provinces – in traveling by planes, trains and automobiles to arrive in Victoria, BC by Monday afternoon 16 October 2017. Alas, weather and delays caused some not to arrive for the opening part of the Assembly program. Among the many that did make it were the three delegates from Winnipeg - representing the Archeparchy of Winnipeg, the Archdiocese of St. Boniface and the Archdiocese of Winnipeg. 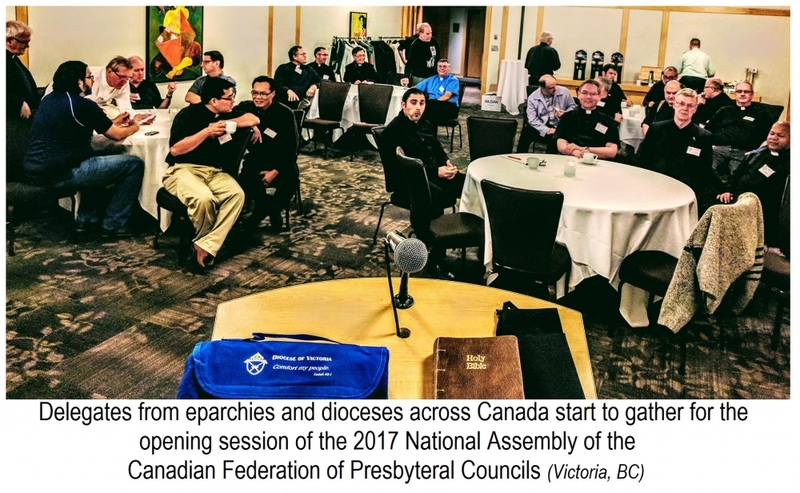 The CFPC is the Canadian Federation of Presbyteral Councils that strives to represent and provide assistance to priests serving the Catholic Church around Canada. Over the years, the Federation has held conferences that deal with issues of importance to clergy health and effective ministry. This year, the four-day CFPC national assembly is tackling the theme of, “Ethical/Moral Issues in Ministry Today”. The challenges that priests face themselves in their personal lives and among the people that have been entrusted to their pastoral care are constantly increasing and becoming more complex. However, there is always a right and successful response. A number of speakers will present information and suggest pathways to follow. The clergy themselves will discuss the matters with the goal of finding positive approaches in dealing with the issues. The guest speakers in Victoria are: the Bishop of Victoria, His Excellency Gary Michael Gordon; renowned medical ethicist Sr. Nuala P. Kenny; assessment team leader from the Sundown Institute Dr. Michael Sy and former CFPC Vice-President (Central Region) Fr. Alan Campeau. 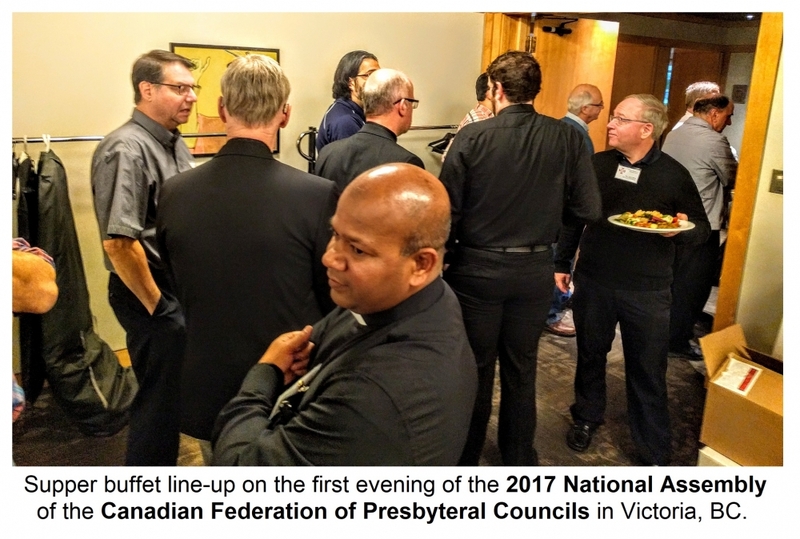 After the registration and the traditional orientation for new members, a time of informal meeting, networking and fellowship was hosted by the outgoing CFPC National President, Fr. Doug McNeill (St. John NB). An earlier supper (of authentic west coast seafood and more) was held in a private conference room. The first real highlight of the evening was surely the evening Mass held in what turned out to be a rather small, yet comfortable chapel in a main floor conference room. The Assembly was taking place at Victoria’s Inn at Laurel Point and the facilities and service has proven beyond perfect for the needs of the CFPC gathering. At this opening Eucharist Liturgy, the Bishop of Victoria, Gary Gordon, was the main celebrant, assisted by Fr. Michael Kwiatkowski of the Archeparchy of Winnipeg and Fr. Gregory Smith-Windsor of Saskatoon. It was the feast of St. Marguerite D’Youville on the Latin calendar and the Bishop spoke of her heroic example during the homily. Her dedication to serving the Lord and His People in spite of unbelievable hardship and rejection from those who should have been supporting her efforts is an example to all those who may wary of working for the Lord and His Church. She was proclaimed by Pope St. John Paul II to be the first Canadian-born Saint. The choir “Vox”, from the local Holy Cross Catholic Parish, provided inspiring song and music throughout the Liturgy. Following the Liturgy, the delegates gathered in the conference hall for the Keynote Address given by Bishop Gary Gordon. 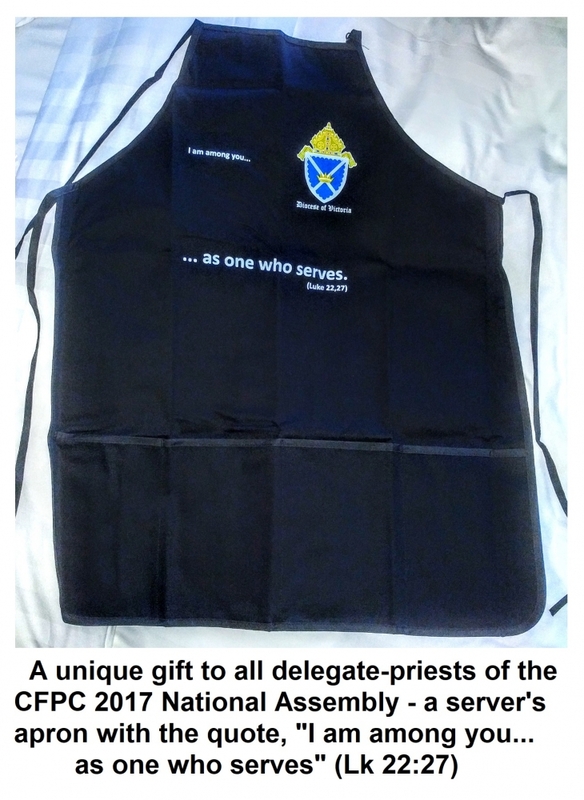 He spoke at length about the theme of the conference – ethical and moral issues in priestly ministry. He explained that the first important aspect about such issues is to recognize that they involve and pertain to people. They are invariably human resources issues. These issues become more and more complex as they evolve. And we have a basic “plan” to respond to them and to deal with them…. i.e. the 10 Commandments; the 2 Greatest Commandments; fundamental principles like “do good, avoid evil” and the basic “life and death” principles [principles that cannot be transgressed without them being violated nor without the humans involved with the transgression being violated]. The Bishop also stressed that these moral issues always involve ‘conscience’. Conscience will be always central – whether it is an “informed” conscience or one that is “uninformed” or “misinformed”. He offered a number of examples that he used from his own pastoral experience as a bishop over the years and especially at the present time. One thing that should always be remembered and which will help us in dealing with our own moral dilemmas and those of the people we serve is the greeting expressed to Mary at the annunciation. “Rejoice highly favoured one, the Lord is with thee” (Lk 1:28). We should hold this as a reminder of the value of each of us – ourselves and the many others who are in need of God’s mercy and His love. They are highly favoured and loved and the Lord is with them. 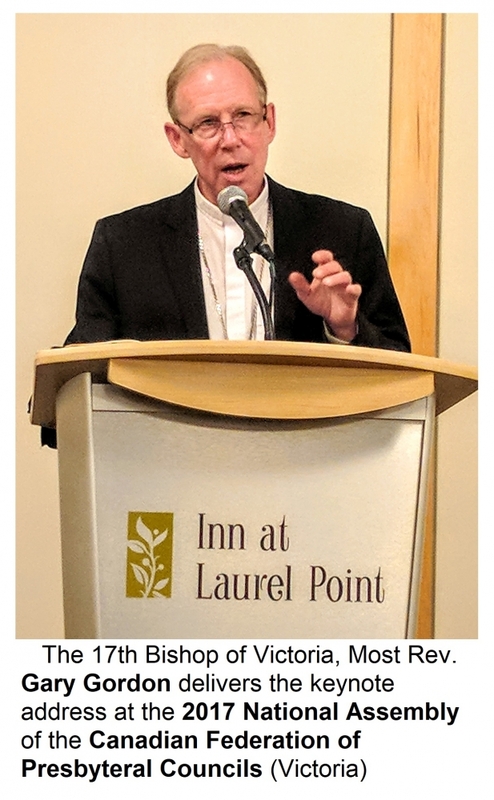 Bishop Gary felt that a few things are essential to priests if they want to successfully tread through the challenges of ethical and moral issues in our day…..
2. we must maintain a “deep, deep” prayer life. [He said that when the Canadian Bishops recently met with Pope Francis in Rome, he often came back to the insistence that the Bishops and their clergy must, “be men of deep prayer”. He concluded that as we strive to provide accompaniment… there will be success in fulfilling our ministry. “no one will resist accompaniment forever” sooner or later, but inevitably, they will come around (as we too will come around) to seeing things as the Lord wills. By the time the first day was done it wasn’t that late, but not a few clergy decided to call it a night. Besides the fact that many had made long journeys to get here, for some it was already past midnight in their home parishes. The National Assembly continues until Thursday, 19 October 2017.